I made these for my daughter's birthday party this year. They turned out so cute and they were so easy to make. 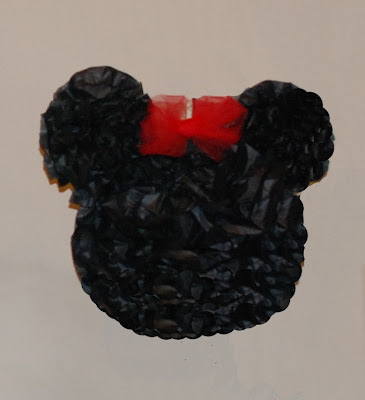 I didn't take pictures of the step by step when making the Minnie puffs, but I have pictures of a different one. Enjoy! Use one pack of tissue. Lay all 10 sheets flat and cut to desired size. For the head I used the size that it was. Fold accordion style like a fan. 1 inch folds. Tie fishing line around the center of your fan tightly. Leave a long end if you want to hang. Another cute idea that I did with these was for our Young Women New Beginnings. We tied them with tulle and left enough to hang them from the ceiling. 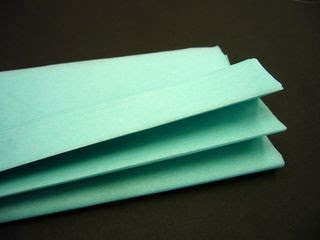 Start puffing out fan by separating each sheet of tissue. For 2 ears I used 1 pack of 10 sheets of tissue cut in half and follow the same instructions. I used a stapler to attach them to the head. Attach bow and that's it! Hi friends! Thanks for stopping by! If you haven't yet please follow me and leave a comment and let me know you were here. I appreciate all the support! Now on to the good stuff! So are you excited for Halloween?! I know you probably haven't even been thinking about it but I've been wanting to share this project since I started this lil spot! It's almost August and that means just a couple months till Halloween! Hey if my summer is coming to an end (much to soon!) I need to have something to look forward to! Anyway, my cute little Deni loves loves loves Minnie Mouse! 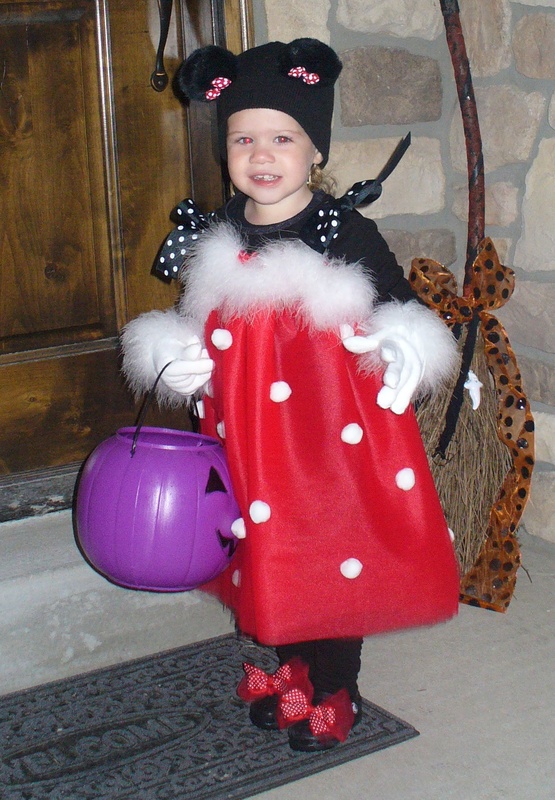 So last year when I asked her what she wanted to be for Halloween it was no surprise when her answer was Minnie Mouse. Now I'm not into character clothing. My girls can wear all the character and princess pj's they want, but we don't own one princess or Dora t-shirt. It's just not my style. So when it came time to look for a Minnie Mouse costume I just wasn't impressed. $40 for a cheesy not very well made and only includes the little dress costume....so not for me! So I set out on making my own. It turned out so stinking cute! Of course that is 100% my opinion. :) I did it very similar to the girls dresses I made a few weeks ago and you can see that tutorial here. We used this adorable costume for Halloween last year and her birthday party a couple months ago. Here are the differences from the tutorial on the Summer Dress. The measurements ended up being perfect to leave the tulle folded in half for the length by 4 yards for the width. 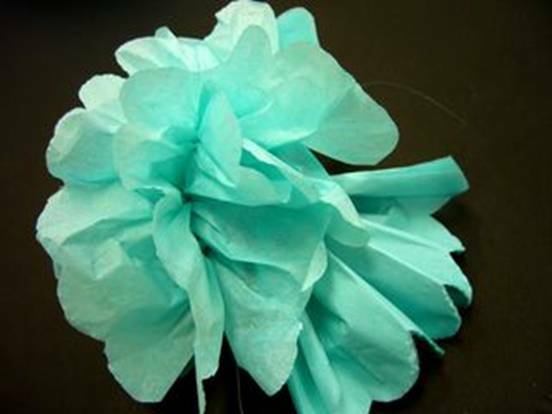 Attach white pom poms with craft glue. Make sure the glue only goes through the first layer of tulle. Hand sew feather boa on seam where you've inserted the elastic. I also glued the edges of the boa to keep it from unravelling and leaving feathers all over my house. Hand sew feather boa to top of white gloves. Bows for shoes. 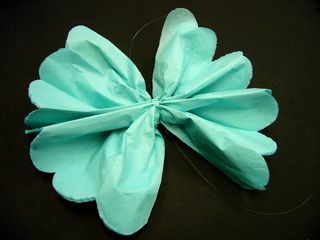 Tie tulle in a bow and hot glue ribbon bow on top of it. I used twisty ties (you know the things on bread...that's what we call them) to attached them to her black shoes. We added the beanie in this picture...it was so cold! You can also see the shoes really good in this one. 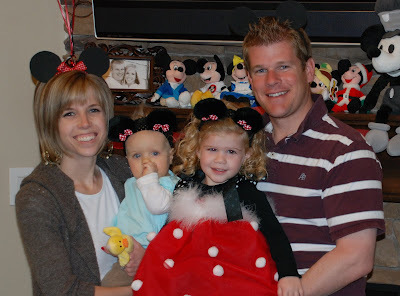 Deni also wanted a Minnie Mouse birthday party this year so this costume got double duty! We had a big mousketear adventure and I made each child their own Mickey/Minnie ears. It was super easy! Get headbands from the dollar store (mine came in a 4 pack) cut ear shapes from thick black foam. I purchased one piece for $1 and it made 8 headband ears. Hot glue ears to headband. For the Minnie ears I hot glued a bow on. They were a huge hit at the party and the left over ears are favorites in the dress up box. I'll be sharing a few more projects from the Minnie birthday party later this week or next. Have a fabulous day! Enjoy! Our little family all sporting Minnie and Mickey ears at Deni's 3rd birthday. I just need to say thanks to everyone that has left such nice comments, emailed me, featured my projects and clicked to follow my blog. This blog has been so fun! It's helped me to hear from you and to see new followers. If you haven't become a follower yet please do and leave me a comment so I know you've been here! Thanks again you really have no idea how much I appreciate your support in starting this lil blog! This is my mother's day gift at it's best! My husband does all the work of planting our flower beds and pots and I get so excited for them every year! Flower beds for me are like an accessory for your yard. It brings beautiful colors in and makes it a wonderful place to be. We spend lots of time out here. I love that I get to enjoy my mother's day gift all summer long! Enjoy! This dresser has been in the works for over a year! Why you ask? Because stripping 2 coats of 60 year old paint out of detail work takes so much time! And I'm a perfectionist so that probably added to it. I do have to say that on a flat surface the paint came off like a charm! I used spray paint stripper and it was so easy to use. This dresser has been in my family for a long time. It was used by all my aunts and mom growing up and then used by me all growing up. When my mom was young they had put a coat of white on it and then a coat of pink. The paint was old and cracking and not in good shape. 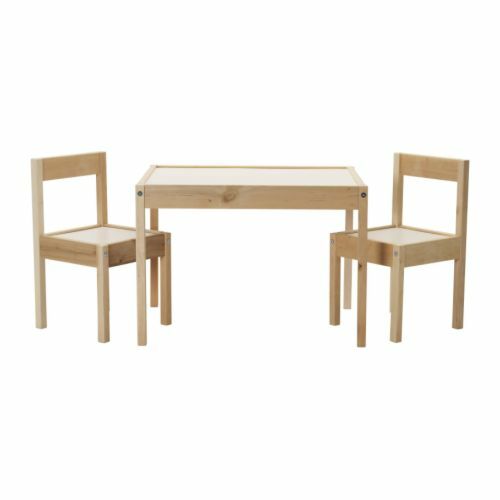 I love how it looks now and I'm so glad that I have it for my daughter to use. Enjoy! Also if you haven't clicked to follow me please do! I also love comments so let me know that you were here! I used Kilz spray primer and Krylon Glossy White. The dresser had long handles on it before so I filled the holes with wood filler and sanded it down before I painted it and then added the knobs. The dresser finished and beautiful! My fabulous sister-in-law is taking our family pictures this weekend. I decided to go with coral, white and tan for our colors. We've always done blacks or browns so I'm excited for some bright new fun colors. I found our outfits easily, but was stuck when it came to finding shoes for myself. I have small feet (size 5) and it's difficult to find shoes that fit that aren't a fortune. If you know me you know that I have love shoes and would say that I have a slight obsession! To accommodate my obsession and thrifty living style I cannot pay more than $30 (if that much) for a pair of shoes...I just can't bring myself to it! So I've been on the lookout for some cute white or coral wedges to go with my outfit and kept coming up with nothing! I've seen a few people that do shoe embellishments, but I decided to do a total shoe makeover. I've been going through my stuff and have a pile of things that need to go to the DI (local thrift store). There on the top of my pile was this pair of green shoes that I got for $5 about five years ago. I loved the shape not necessarily the color, but I still got them. They have hardly been worn and were making their way to the DI until now. Also in my pile was an old swim suit and it had the perfect color of coral lining. Here's how it went. Sorry I don't have more pictures! I really had no idea what I was doing or if it would even work and I was just going with it. Lay material over the area that will be covered and cut an approximate shape making sure to leave extra to tuck under to glue to the inside. I used modge podge and it worked fabulously! Start at one end putting glue just at the edge. Only put glue on the outside of the shoe when absolutely needed. When wrapping the fabric to the inside cut little slits so the fabric doesn't bunch up and lays flat. When doing the heal I pealed back the liner (silver) on the inside bottom. Glue the material on and then glue the liner back in place. Once the entire shoe was done I added the ribbon ruffle. I did a straight stitch with my sewing machine and then gathered the ribbon. Attach to shoe with hot glue or modge podge. Just a little note if you use modge podge you will need cloths pins or bag clips to hold it in place while it dries. What do you think? Not bad for some old stuff that was going to the DI right? I absolutely love how they turned out and they will work fabulously for our family pictures! I hope you enjoy! If you have any question please email me or leave a comment. I'd love to hear from you! Also if you haven't clicked on the side to follow me please do! Have a fabulous day! Hey everyone! I made it back from girl's camp on Saturday and have been enjoying the past couple days with my family. I missed them terribly, but had so much fun at camp! I'm trying to get back into the swing of things and I started with a very easy, yet fabulous project. I needed a new bright fun colored wreath for my front door, but I didn't want to break the bank! I got the idea for this wreath from All Things Thrifty and it was only $3! Glue lima beans to wreath covering entire wreath form. Apply a couple coats of spray paint. 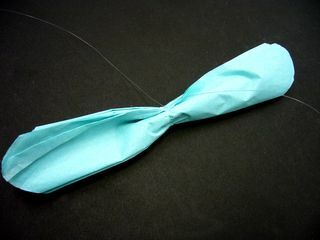 Add ribbon for hanging. And you're done folks! Easy peasy! Enjoy! Hello everyone! Happy 4th of July! What a wonderful day to celebrate the freedoms that we have in this country! I feel so blessed to live in this day and age and to have such amazing people that serve our country and give themselves so that we have our freedom. Thank you to all those that have served or are still serving! And a big thank you to their families for being loving and supportive and giving your family members to fight for all of us. I hope everyone has a wonderful week! Enjoy!